In the Shepparton CBD there are approximately 1,137 metered on-street parking bays, 457 time restricted on-street parking bays, 572 unrestricted on-street parking bays, 260 ticketed off-street parking bays, and 904 free off-street parking bays. Time limits are necessary because they allow us to make sure everybody has a fair chance to find the right park for their purpose. Time limits are shown on the kerbside signs and at the entrances to parking areas. The time limit applies to a section of road or a parking area and not just the bay in which you have parked. So, once the time limit has expired, you must move your vehicle out of that area. It’s not permissible to move your vehicle to another bay in the same area. You are also not allowed to simply put more coins in the meter. Parking is currently free on Saturday (with the exception of the privately owned multi-deck car park), however time limits still apply and are enforced. Parking permits are available in a number of Council off-street car parks. 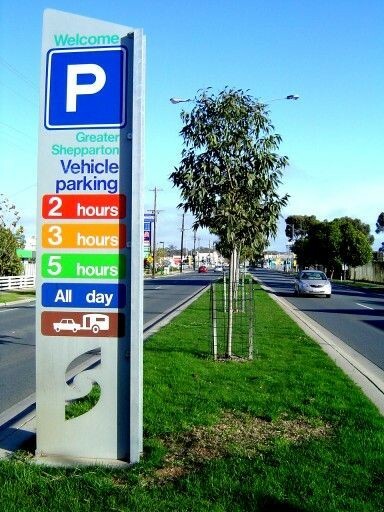 Enquiries about parking permits should be directed to the Parking Department at the Council Offices in Welsford Street , Shepparton, or by phoning 03 5832 9700.